Meguiar's Gold Class Rich Leather 3-in1: Cleaner, Conditioner, Protectant - 16 oz. 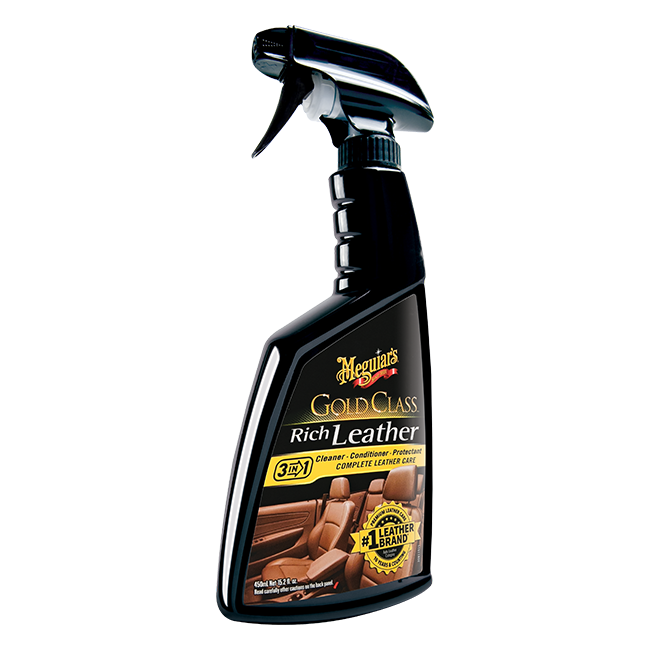 Meguiar's Gold Class Rich Leather 3-in-1: Cleaner, Conditioner, Protectant - 16 oz. Meguiar's Gold Glass Rich Leather Spray pampers and protects your leather with gentle, safe cleaners and rich, luxurious moisturizers. This unique spray formula with aloe helps protect leather from spills and stains. UV inhibitors help prevent premature fading, aging and cracking of leather surfaces. Meguiar's Leather Cleaner/Conditioner Bottle, D20180 - 12 oz.